Airdronians can’t throw a rock without hitting a single-family, multi-family or commercial building constructed by McKee Homes. The prolific builder has been a presence in the city for the past 30 years, making dreams come true one home at a time. After emigrating from Northern Ireland with his family in 1981, Martin McKee found work with construction companies in town. Then one day he came home and told his wife Ruth that they were going to open their own company and build some homes. Ruth supported her husband’s vision and McKee Homes was born. When McKee hung out his shingle in 1987, his was a two-man operation run out of the basement of the family home. He recruited Rob Doel, McKee’s daughter Elaine’s then-boyfriend and now husband, to join his team. “My dad risked everything to start the company,” says Grace McKee, Martin’s daughter and executive vice president of McKee Homes. McKee started his homebuilding company with $5,000, which he used to option three lots from Melcor Developments in Meadowlark in 1987. In the years that followed he slowly and steadily grew the business. Within a few years, McKee Homes had moved out of the basement and into a tiny office space in what is now Waterstone in Airdrie. The staff grew as well: Elaine McKee Doel joined the company in 1990 and Grace joined a few years later. “Starting out so small, all three of us came in very early on in the process and learned it from the ground up. We had no choice but to do every position,” says Rob Doel, land and development manager. Rob started at the end of a shovel, doing everything from laying rebar to pouring concrete to erecting walls. He moved into sales and learned from Martin at development meetings and lot draws. Grace started out answering phones but turned her talents to building a database, determining pricing, and then found her calling in design and estimating. “It’s interesting to look back, because the three of us have gone where our natural strengths took us,” says Elaine McKee Doel, president. Together the family grew the company into a major homebuilder in the city, helping to shape the residential landscape of Airdrie. They offer clients the complete package – their years of experience and diverse talents and education mean McKee Homes can take good care of clients every step of the way. Over the past 30 years, McKee Homes has built well over 3,000 homes for around 9,000 people – an achievement the entire staff is proud of. Each homebuyer is treated like family and each home carries the high standards set by Martin McKee. When the patriarch passed away in 2006, the family was determined to continue to run his company as he had, reinforcing his values of quality, integrity and honesty. “We really wanted to re-establish our identity as a company and make sure people knew that McKee Homes was here and wanted to continue to be here,” Elaine says. They redefined and re-enforced the company’s mission and vision that would carry the next generation forward. Their mission is to craft exceptional homes for their valued customers and their vision is to be the most highly sought-after homebuilder in their chosen markets. “That’s what we do. That’s our reason for getting up and coming to work,” she says. The mission has been accomplished. McKee Homes has a solid reputation for great quality, exceptional service and amazing design and innovation. 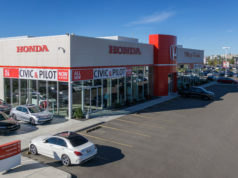 The company is currently building in four areas in Airdrie – Cooper’s Crossing, Bayside, Ravenswood and Hillcrest – as well as Vista Crossing in Crossfield. Just as every family is unique, so too are McKee homes. No two homes are the same. Clients can modify an existing floor plan so it better meets their needs and tastes or they can completely customize a design from start to finish. The company employs three home planners who consult with clients and help them through all the design selections, large and small. Having educated, experienced people to guide homebuyers along is a huge advantage and it demystifies the at times overwhelming process. Sometimes the best way to clarify what McKee Homes can do is to show people. McKee has dozens of show homes representing many different home plans to serve as jumping off points for clients. Seeing a final product can help clients figure out what they want in their own homes and to more easily visualize the possibilities. “Grace works really hard to make sure that the show homes are all unique so we can show people a bunch of different options and they can see them applied to a house. I think that really helps people make a decision,” says Heather Yates, sales manager. Rather than staging a home so it represents a family environment, Grace and her team ensure McKee homes are designed with families in mind from the very start. Their homes are practical, functional and beautiful spaces for all types of families to grow in. Every detail is considered to ensure customers get everything they want as well as everything they didn’t know they wanted. And with access to design websites, architectural magazines and television networks, today’s homebuyers arrive armed with examples of the things they like and want to incorporate in their new home. McKee Homes has great designers to implement these ideas and fantastic trade partners who are always on top of trends and new products in the marketplace to help clients get exactly what they want, whilst keeping in mind affordability and value. “It’s exciting for us to be able to send our clients to our partners and know that they are getting the best and most current products,” says Grace. Partnerships fuel the company, whether they are with clients, staff, developers or trades. McKee Homes has enjoyed many long-term relationships with its partners who share the builder’s philosophy and high standards. McKee Homes stands behind its product and if there are any issues the team and its partners are dedicated to making it right. They strive to ensure complete customer satisfaction at every level. After all, clients are more than just business transactions. They are friends and neighbours, and everyone at the company takes pride in knowing their friends are living in and loving their McKee home. McKee-built homes are found throughout Airdrie. So is the McKee name. The family is a proud local builder that lives in and supports the community. They attend many fundraisers and are happy to sponsor events and organizations to make it a better place to live. When Genesis Place announced it needed to rebuild its pool, McKee Homes stepped up with sponsorship and remains an ongoing supporter. It has also supported everything from sports teams and rodeos to the Airdrie Food Bank and the Boys and Girls Club. Family is paramount at McKee Homes, and there is often a family connection to its community involvement. McKee Homes hosts an annual golf tournament in memory of founder Martin McKee, with all proceeds split between Community Links, Agape Hospice and the Airdrie Hospice Society. Over the years McKee Homes has donated more than $158,000 to these causes. It also sponsors the George McDougall High School Ride of the Mustang in which teams of students ride stationary bikes for 48 hours straight to raise money for the Alberta Children’s Hospital. In the past six years students, including Rob and Elaine’s sons who attended the school, have raised nearly $650,000, making them one of the top fundraising charity events organized by youth in the province. McKee Homes is committed to the community and to the industry, and those two areas came together in another innovative program called Building Futures. Four years ago, Rob and Elaine’s sons’ teacher approached the couple with a crazy idea: creating an unconventional learning opportunity for Grade 10 students. They readily agreed to be involved. “Before we knew it we had 34 kids full time on our job sites, where we built them a temporary learning centre in the detached garages for teachers to work with them on their entire academic curriculum, all the while building two houses,” says Elaine. Students from the three public high schools spend the entire year learning in a very different way. They link the things they learn in the classroom to real-world applications, never again needing to ask why they have to learn math or if knowing how to speak in front of other people is important. Attention to detail and pride in one’s work filtered from the job site into the classroom, and some students who came into the program with struggling grades left it with vast improvement. Building Futures gives students confidence and leadership while exposing them to a range of career options they may otherwise never have known existed. “They get a taste of it all, right from excavation of the basement and concrete pouring to framing and insulation and drywall, and they get experience in all the trades and professions. It’s job experience for 80 jobs, all in 10 months,” says Rob. During the school year, students get to experience every step of the process, including those that go beyond building. Last year there was a design component in which students were asked to complete a design board to plan the furniture and decor that meets the family’s needs while staying on a budget. McKee Homes also teaches students about sales with a Realtor open house during which they can interact with professionals in the industry. Students also learn about mortgages and financing, which will serve them when they become homeowners themselves. To enhance the experience for students, McKee Homes brought in SAIT to partner with the initiative. A faculty of construction instructor comes out to work with the students on projects and invites them to tour the campus to get an idea of what programs are available after graduation. 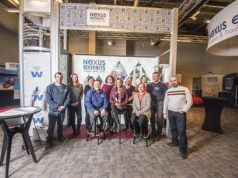 There have been students from the first years of Building Futures who are now attending SAIT or studying engineering, and one student has gone to work for McKee Homes. It has become a highly coveted program, with more than 100 applicants hoping to secure a spot each year. This interest is great news. 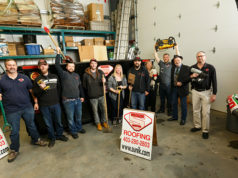 The McKee team knows how tough labour shortages can be and is excited to help generate more enthusiasm about trades among young people. The program has attracted a lot of attention and acclaim during its short life. In 2014, Building Futures was awarded second place in the Canadian Education Association’s Ken Spencer Award for Innovation in Teaching and Learning. And last year, Kingsmith Homes in Cochrane was inspired to start its own Building Futures program for high school students there. “I continue to be really proud of all those people who put their trust in us that this was going to work and it was going to be great – and it has been,” says Elaine. The Building Futures program is only one of the areas in which McKee Homes has been forward-looking and invested in the future. Since it started 30 years ago, the company has always tried to stay ahead of the curve in many areas including energy efficiency and better building practices within its homes. Now, as it celebrates three decades in business, McKee Homes is looking ahead as much as back. When the new national energy code was adopted on November 1, 2016, McKee Homes didn’t have to make any changes to its practices as it was already meeting or exceeding the standards and regulations. Instead it took it a step further and began using triple-paned windows for even greater efficiency. In fact, McKee Homes is now looking at efficiency in a different way. With the carbon tax promising higher power bills, the McKee team is looking at implementing technology into their designs to help further reduce utility costs for clients, whether that is through LED lighting, Lutron dimmers and lighting controls, or using the best efficiency appliances. “There are some cool affordable products out there that people can use, and we’re really going to look into that for 2017,” says Grace. While 30 years in business is an incredible achievement, the milestone won’t change how the company operates. The coming years will see the McKee team simply continuing to do all the things that have made it successful to honour Martin McKee’s vision for the company. 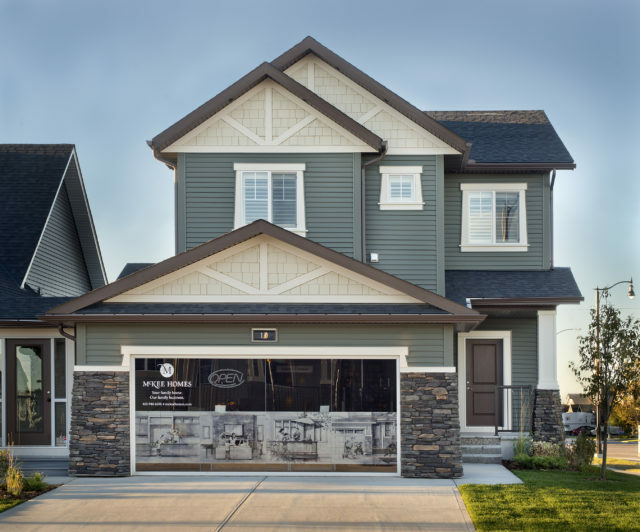 They vow to maintain their high standards, unbeatable quality and unwavering commitment to Airdrie and its residents in order to reach their main goal: to create incredible homes for happy clients. “We love what we do. It’s so rewarding to build a home and have people move into it and live there,” says Grace. And with thousands of Airdronians happy in their McKee Homes builds over the decades, McKee Homes’ love for the business and the community shines through.